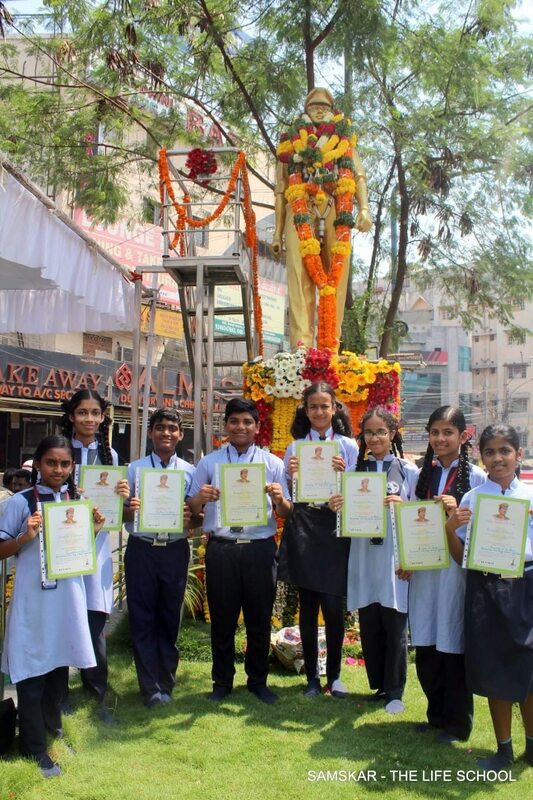 On the occasion of IPS officer Late Sri Umesh Chandra's 53rd Birthday celebrations, our Samskarian Students partiticated in the Garlanding Ceremony to Sri Umesh Chandra IPS Statue and then we are very happy and proud that out students were honoured with a memento and certificate under the category Best Responsible Students of the year. =================================== SAMSKAR - THE LIFE SCHOOL ... ....For Education , Ethics & Ethnicity !!! Why "Samskar - The Life School" ? * International Quality Award for Excellence in Early Childhood Education, from "BrandsImpact." * Indian Achievers Award for Education Excellence for outstanding achievement in Education & Social Service, from "Indian Achievers Forum." * Pride of Indian Education Award for Fastest Growing School for Innovation Early Childhood Education (South India), from "BrandsImpact." * Global Education Excellence Award for Best Emerging Private School in Hyderabad., from "Prime Time Media." The Torch Bearer Award for Excellence in Education from " Your Baby Can, India & USA" presented in Bangalore. - First School in entire Telangana to introduce Full fledged 3D educational content. - First School in entire Telangana to introduce SOI ( Structure of Intellect ), The 90 Cognitive Learning abilities Diagnosis, Assessment and Training Program. - First School in entire Telangana to introduce YBC Your Baby Can , both Mother & toddler together Language Learning Program for Children of age 6 months to 3 years. - One of the Best Emerging High Schools In Hyderabad. - One of the Best CBSE Schools In Hyderabad. - Best Xseed Partner School in Hyderabad. - Most Innovative Pre-Primary School in Hyderabad - Best Schools in Hyderabad for wholistic Education with equal emphasis on Ethics & Ethnicity. - Best Schools in Hyderabad for Experiential Learning.